Balance is one of the key factors for any crane in the industry. Without the right balance, a crane will lose its stability. To avoid this, all cranes know the principle of the ‘counterweight’. In most cases this counterweight is at a fixed point on the crane, but on an E-Crane, the counterweight is linked to the stick, so it can automatically compensate for the lifted load. The balance crane provides a fail-safe system which guarantees that the crane will always be in balance. The link between the stick and counterweight creates a 4-bar mechanism, which ensures that the counterweight continuously balances the total weight of the steel structure along with half of the operational load.  As the lifting radius is varied, the change in the load moment is automatically equalized by the moving counterweight. Lower energy consumption means lower costs!  With traditional hoisting machinery, the payload, working tool, and steel construction have to be raised, but the E-Crane’s balance compensates for all but the payload. It goes without saying that this results in important energy savings. To be balanced at any given position, the counterweight has to continuously compensate for the load. As the load increases, the counterweight must also increase in weight. Alternatively, instead of increasing the counterweight, it could be moved further rearward from the center of rotation to compensate for the increase in the load. For example, a one ton load at a twenty foot radius gives a forward load moment of twenty. This load moment would then be equalized or counterbalanced by a 4 ton counterweight at a distance of five feet, having rearward load moment of twenty (20 x 1 = 4 x 5). Since adding counterweight is often neither practical nor, in some cases, recommended, true balance of a fixed counterweight crane can only be achieved at one specific radius. Any variation caused by changing the radius at which the load is lifted, destroys the balance.